“The course of life is unpredictable. No one can write his autobiography in advance.” Abraham J. Heschel. Origin: 1900-1905; Americanism; orig. uncert. “Impulsive” Mars and “Depressed” Saturn are conjunct in “Divorce Court” Libra. Both Saturn and Mars are opposite “Loose Cannon” Uranus in “Give ‘Em Hell” Aries. Moon leaves “Escapist” Pisces to “Confront Everybody Head On” in Aries. Problematic Cardinal T-Square is fully operational and building. A lollapalooza of a day, to say the least! 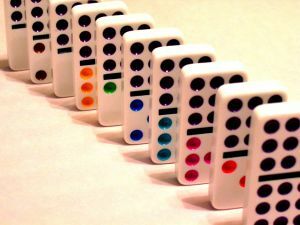 “It’s a day dominoes could suddenly come tumbling down because some fool sneezes or swears. We can only hope that it won’t be Mel Gibson. It’s an uncertain, tumultuous time period on the planet. We need to keep melodiously chanting, ‘Yes we can, yes we can,’ to somehow make it through this tortuous era that the Universe has sent us because it can. And we’re all sitting ducks with no place else to go. My advice: Stay inside your house. Keep securely fastened to the couch or recliner. Maybe watch Oprah summer re-runs. Whatever you do, don’t sneeze or swear. Breath very subtly. Again, out of concern for the dominoes crashing and leaving an untidy mess. And be extremely careful adjusting the volume on your TV dial. Only answer the doorbell if it’s George Clooney or Domino’s Pizza. It could be, too, on this troublesome day, that George Clooney has gone to work for Domino’s Pizza in their delivery department. Times are hard for everyone, everywhere. But, we’ll get through this. I might be stopping by again soon. Leave a light on.